Flasher ARM is a programming tool for microcontrollers with on-chip or external Flash memory and ARM core. 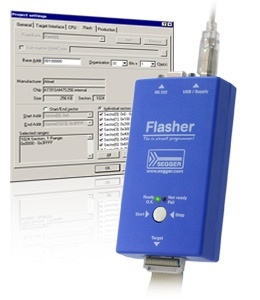 Flasher ARM is designed for programming flash targets with the J-Flash software or stand-alone. In addition to that Flasher ARM has all of the J-Link functionality. Flasher ARM connects via USB or via RS232 interface to a PC, running Microsoft Windows 2000, Windows XP, Windows 2003 or Windows Vista and has a built-in 20-pin JTAG connector, which is compatible with the standard 20-pin connector defined by ARM. Please note that the actual speed depends on various factors, such as JTAG, clock speed, host CPU core etc. The target is clocked at a fixed clock speed. The maximum JTAG speed the target can handle depends on the target itself. In general ARM cores without JTAG synchronization logic (such as ARM7-TDMI) can handle JTAG speeds up to the CPU speed, ARM cores with JTAG synchronization logic (such as ARM7-TDMI-S, ARM946E-S, ARM966EJ-S) can handle JTAG speeds up to 1/6 of the CPU speed. JTAG speeds of more than 10 MHz are not recommended. Selects the maximum JTAG speed handled by the TAP controller. On ARM cores without synchronization logic, this may not work reliably, since the CPU core may be clocked slower than the maximum JTAG speed. If the target provides the RTCK signal, select the adaptive clocking function to synchronize the clock to the processor clock outside the core. This ensures there are no synchronization problems over the JTAG interface. If you use the adaptive clocking feature, transmission delays, gate delays, and synchronization requirements result in a lower maximum clock frequency than with non-adaptive clocking. Do not use adaptive clocking unless it is required by the hardware design. Please contact Glenn Moloney to discuss your configuration and get a quotation today.